Discover the delights of Hangzhou on a day trip from Shanghai, including lunch. 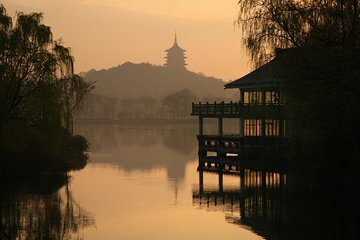 Depart Shanghai by air-conditioned coach, and travel to the city Marco Polo called the ‘the noblest in the world.’ Once a terminus on China’s Grand Canal, Hangzhou drew artists and poets from the 9th century on for its West Lake, a vision of calm waters, pavilions and islands. Learn Hangzhou’s history from your guide as you enjoy a lake cruise, visit a garden and green tea plantation; and admire the ancient Six Harmonies Pagoda and more.